It’s almost Valentine’s Day! Traditionally, it’s a day filled with a lot of roses and boxes of chocolate. Since it’s the biggest holiday celebrating love, what about using it as a reminder to treat yourself? We all deserve a little special treat from time to time and it’s the perfect time. I have some simple ways to treat yourself this Valentine’s Day with ideas on reinventing a small space in your home, organizing your favorite things or spoiling yourself with a manicure. Let’s have fun! Recreating your space can be just the perfect way to celebrate you. Maybe you’ve been wanting to create a reading corner or carving out a little space for crafting. Family Dollar is a great place to shop for inexpensive home decor. Wall Art. I just spotted the perfect way to designate your own space at home and it’s also a great way to have a little fun too. 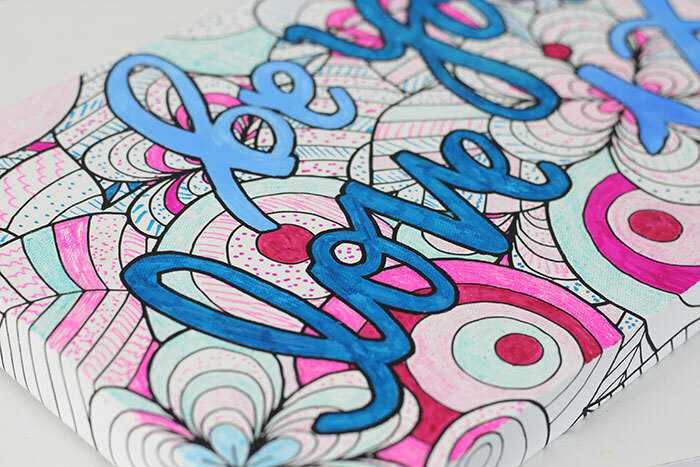 You know the adult coloring book craze? Well, now you can spend the time coloring and creating an actual canvas that you can showcase at home. 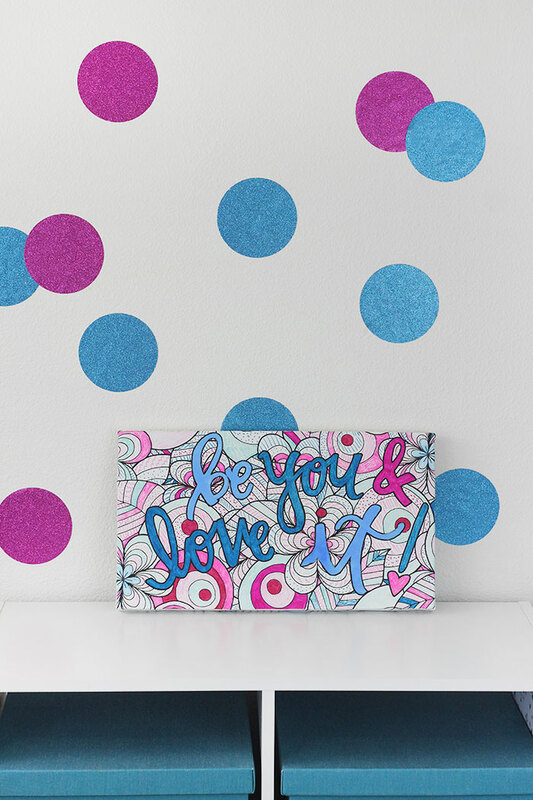 For celebrating you, this one says “Be You & Love It”. I absolutely love the way mine turned out. Bonus! Check out the wall art available at your local store. I found the absolute cutest Glitter Wall Decor Dots, they make it so easy to add personality to your space. Ambiance & Accessories. Add quick ambiance and personality to your space with great smelling candles. 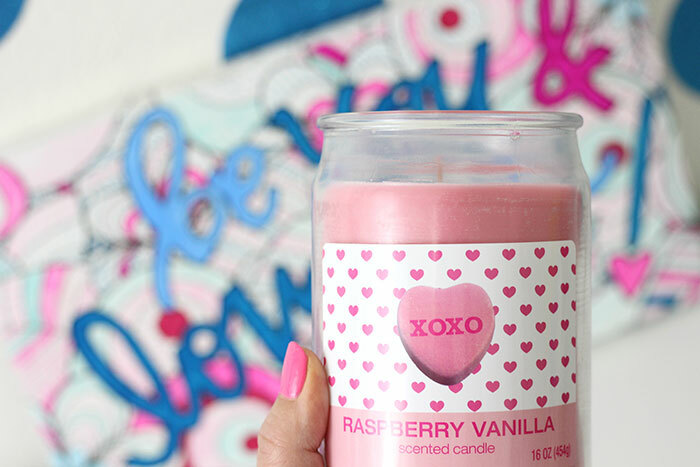 I’m loving this Raspberry Vanilla candle from Family Dollar. It smells amazing. They also have a great selection of faux flowers and other home accessories to brighten and liven up your space. Organize & Cherish. Sometimes feeling great starts with getting your life organized. I found an awesome idea starter at Family Dollar this week. Check out these boxes and what makes it even better is that the message celebrates that self-love we’ve been talking about. 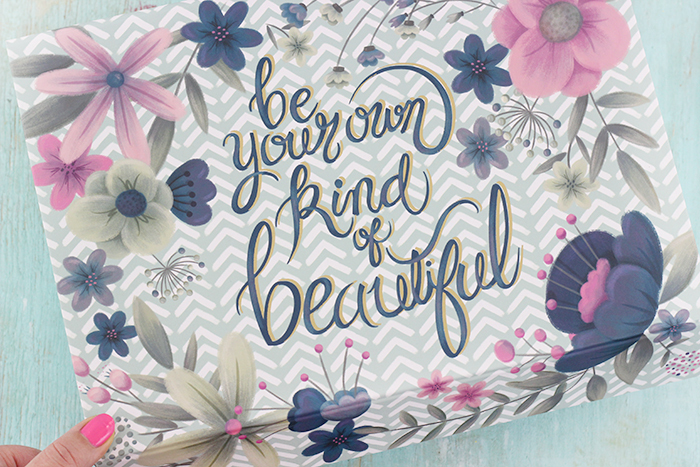 This one reads “Be Your Own Kind of Beautiful”. These are great for storing and cherishing photos, but you can use them for so many storage solutions. I love these boxes for making the unorganized look like an intentional part of your decor. That’s what I call winning. Want to put a little pep in your step? Maybe it’s time to get refreshed. If you’ve been extra busy, just make small goals. In just 15 minutes, you can feel refreshed and rejuvenated. 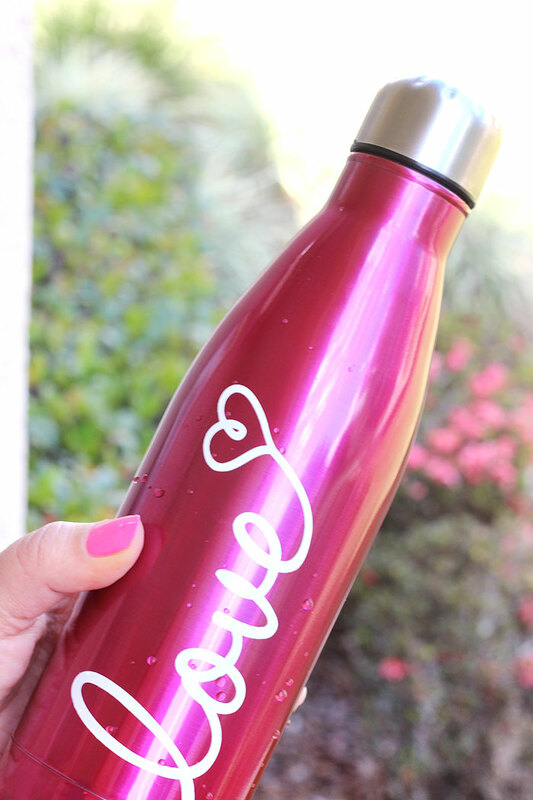 Make me-time extra special with a fancy love inspired water bottle. It only takes the smallest thing to inspire. You deserve to be spoiled. One of my favorite ways to do this is to do DIY spa treatments at home. I’m also really into painting my nails in fun colors and that’s so easy to do when you shop at Family Dollar. They have all of the colors I want at low prices. If you’re feeling extra sweet, you can easily put together a sweet self-care gift basket on a budget. Family Dollar has everything you need to fill it up. From Valentine’s Day themed gift basket to all of the self-care fillers you need. A great smelling lotion, cotton balls, mini pedicure kits, nail polish remover and even exfoliating stone files. Treat yourself or treat a special friend; you’ll feel great either way. Savor the moment. There’s something about enjoying a warm cup of my favorite beverage. Make it extra special with a fancy, but affordable new coffee mug. 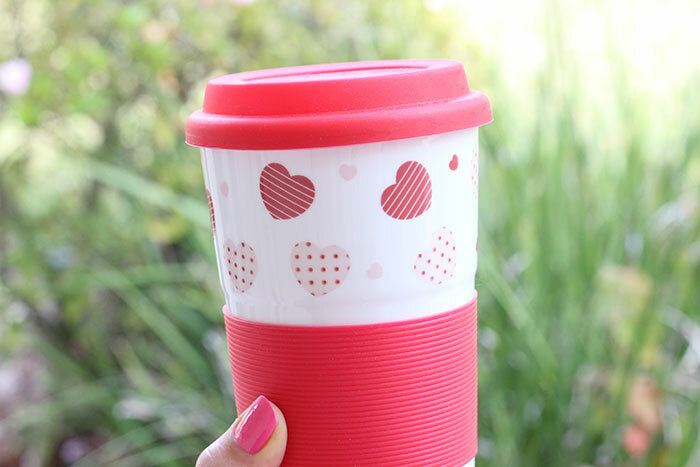 This Valentine’s Day mug just makes me smile. I hope these ideas helped to inspire some ways to celebrate yourself this Valentine’s Day! Save even more by clipping Family Dollar Smart Coupons and redeeming them at the register when you shop; You deserve it! YES! I love to treat myself too! I love your choices you picked out here and think that bottle and nail polish color are both perfect for the spring. 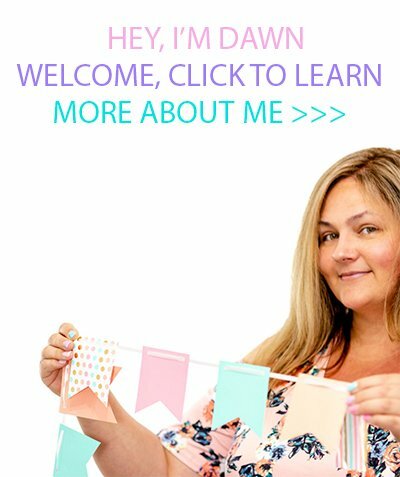 My wife will surely love the idea of your wall decor, it's really cute and fun to do! The candle looks really cute! 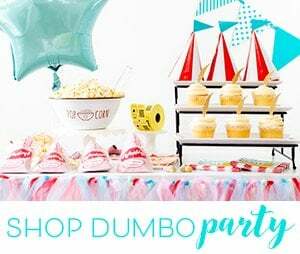 Lots of fun gifts! I'd love to have the wall art, it's super cute and my style. The candle also seems like it would smell pretty yummy.